and the State of "Israel"
Upon the occasion of the dedication of a square in the memory of Theodor Herzl Orthodox Jews will be demonstrating Saturday June 26, 2004 in the city of Vienna, Austria to proclaim and clearly state that: Theodor Herzl is not a Jewish icon to be honored and that Zionism and the State of "Israel" are illegitimate and they do not represent the Jewish people. The State of "Israel" does not represent the voice of Judaism and/or the Jewish people. The Torah clearly forbids the formation of a State, for the Jewish people, in their time of exile. The Torah forbids stealing land, subjugating and oppressing a people etc. The root cause of the endless bloodshed and suffering in the Holy Land is Zionism and the State of "Israel". The root cause for the continual rise of worldwide anti-Semitism is Zionism and the State of "Israel". The Jewish people have been living in Muslim countries, including Palestine, in peace and harmony with their Arab neighbors, until the advent of Zionism. 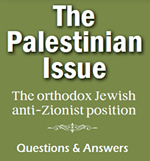 True to the above and for many other reasons, the rabbinic authorities universally, have vehemently opposed the State of "Israel" since the time of its inception. Consequently, Herzl is obviously not to be honored and his ideology called Zionism not to be celebrated. On the contrary, a day of mourning commemorating the birth of Zionism and the State of Israel should be declared. A naming of a square in remembrance of the Palestine of yore should be declared. The only working solution to a true and lasting peace is the total dismantling of this illegitimate State of "Israel" - a transformation to a Palestinian rule. Any other of the countless proposals for peace, whereby the State of "Israel" would continue to exist, is futile. As the Torah states "why are you violating the words of G-d, it will not be successful" (Numbers, 14: 41). Our fervent prayer to G-d is, for this transition from the State of "Israel" to a Palestinian State, to transpire, speedily and peacefully, without any further suffering and bloodshed. Under this new Palestinian rule, we will once again, G-d willing, be able live side by side, Jew and Arab, in brotherhood.